Most clients arrive in the Philippines via Manila International Airport. If you haven't arranged for someone to meet you at the airport you better read 'Airport Transfers' and 'Excess Baggage' before you proceed further. Depending on the day of the week, there are three to four daily, flights from Manila to Busuanga, the airport destination for Coron diving. Those 'Old Hands' who have been to Coron before, will be pleasantly surprised to see the photo on the right featuring the new concrete apron. The old dirt apron can still be seen on the thumbnail to the left for those who want to reminisce. The new apron will allow larger aircraft access to the airport and therefore improve the seating availability. The international code for the airport is USU. The flight will take an hour and you will fly south-southwest from Manila to the airport located in the middle of the Yula King Ranch on the north side of Busuanga Island. 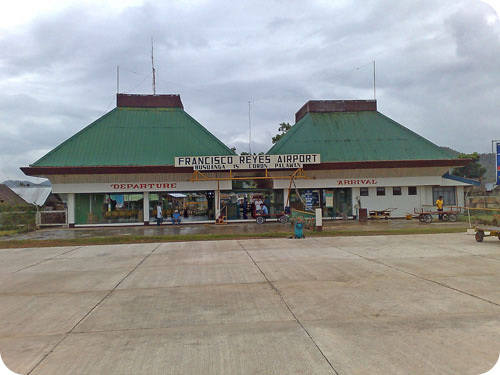 The airport is 28 kilometres and about 45 minutes by road from the town of Coron. All scheduled flights are met by an airline ground service representative and an open jeepney is provided for the Php 150.00 ride into Coron town. If you would prefer an air con van for the trip to town please ask, it can be arranged, though obviously at extra cost. Ask the airline representative/driver to point out, stop at, the place you will be staying. Most accommodation will be easily accessed from where the jeepney will drop you off. If you are carrying full diving equipment to Coron, and especially if you are with a group of divers each carrying full diving equipment to Coron, you should read about Airline Checked Baggage Limits and Excess Weight Charges. Philippine Diving can steer you around the pitfall of booking a seat and getting your baggage bumped if the plane is overweight. Booking your flights online is the most efficient method of securing flights to Coron. If you can't get a flight see "Travel by Ship" and contact us immediately! On Seair flight seats are limited, 19 seats is the total capacity per flight, and you may be told by the airline that a particular flight is fully booked during peak season. The airlines sell blocks of tickets to travel agents who book plush resorts and the airlines lose control over those seats. If those tickets are unsold they are turned back to the airlines at the last moment and are available to wait-listed passengers. Please make your reservations as early as possible. You will pick up your tickets in Manila at the Seair ticket office located at the front left corner of the departure building before you enter the terminal for your flight. Seair's ticketing office opens at 6am and the check-in time for the 07.15 early morning flight, is 6:30 AM. Alternatively we can arrange delivery of the tickets to your hotel if you are staying overnight in Manila. It is now possible to connect from Busuanga Island in the Calamian Island Group, to resorts in the El Nido, Palawan area and on to Puerto Princesa, Palawan with Seair departing Busuanga at 09:10am on Tuesdays and Saturdays. It is now also possible to fly from Boracay (Caticlan) to Busuanga once weekly on a Thursday at 07.40 hrs. This is a one-way service only. Passengers wishing to fly Busuanga - Boracay still have to fly via Manila. 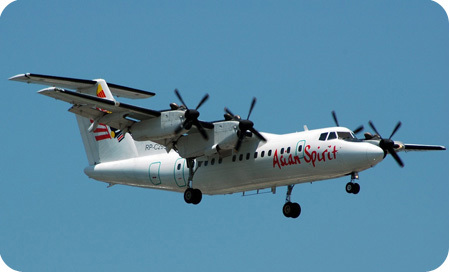 Asian Spirit are another airline flying the sector Manila - Busuanga - Manila and they now operate the Dash 7, 50 seater aircraft, giving a greater seating allocation than ever before. At this time there is only one flight per day on Mon/Wed/Fri/Sat/Sun at 07.20am, but it is worth checking the link below for alterations to the timetable; especially if you struggle to get a ticket with Seair. Asian Spirit Schedules and Booking. Having used the service only last Sunday, November 25th 2007, I have to say it was impressive, and the price was better than Seair at Php3,266.00 inclusive of taxes. There is also a Php200.00 terminal fee to pay in Manila, a Php 10.00 terminal fee at Busuanga, and a Php 150.00 charge for ground transportation, via jeepney, from the Busuanga airport into Coron town or from Coron town back to the Busuanga airport. This applies to all carriers. We don't get a chance to see you in the water on a shallower dive before we drop you in on the wrecks, so please have your advanced diving certification or at least 20 dives of experience. Please have made and logged a dive within the previous 12 months (within 6 months preferred if you have only 10 to 20 logged dives). The normal departure time for diving on the wrecks is 9am. If you arrive unannounced and unanticipated on a morning flight all the wreck diving boats will have left the dock by the time your ground transportation arrives in Coron Town. You can still dive around Coron Town, Coron Island and CYC Island on the day you arrive without giving advance notice. If you wish to dive the wrecks on the day you arrive you should book the morning Seair flight and let us know what day you will be arriving. We will have to arrange a hired air con van, at your cost of P1,200, for your pickup at the airport. The van will bring you straight to the dive shop of your choice and we will arrange for the dive boat to wait for you for about an hour. The open air airline service jeepney that meets each flight at the YKR airport can't depart the airport to carry the arriving passengers to Coron until the aircraft takes off for the return flight back to Manila and would therefore be too late for anyone wanting to wreck dive on the same day they arrive. There is a limit of 10 kg per ticket for checked luggage. Anything above that amount is charged at Php 40.00 per kg. Any excess luggage will be carried if the airplane has the ability to safely carry the weight. There is a physical size and weight limit for the baggage compartments in the nose and the body of the aircraft. The size and weight limits for the baggage compartments can not be exceeded. Problems generally do not happen with a normal mixture of Asian and Anglo tourists, residents, and divers because the Asians are that much smaller than the Anglos. Problems can arise with large groups of big Anglo divers each carrying full diving gear. A full passenger load of big divers with full diving gear can exceeded the carrying capacity of the plane. With large groups of divers we advise that an additional seat be purchased for every four divers who are carrying their diving equipment. This keeps one body off of the aircraft and ensures that there is sufficient carrying capacity for the dive gear. When the cost of one extra seat is divided among four divers the cost is less than as if you paid for 86 kg of excess baggage. Buying the extra seat guarantees that your diving gear will fly with you. If your equipment gets bumped off of the flight it has first priority on the next Seair flight once the passengers are accommodated. Since Seair has two to three flights a day you won't be without your gear for long.